After a long exhausting week at work, university or taking care of your kids at home, there is nothing better than grabbing a cup of tea or coffee with your friends. Whether you choose pastries, an eclair, a burger or kebab, nothing beats having some carefree time to catch up with your friends. It is unfortunate though, that gossiping or Laghw (any idle talk that is not useful) can instantly become part of these social meetings. Sometimes idle talk becomes normal workplace conversation. It can be a slip of a tongue and unintentional, while at other times, the whole gathering revolves around this kind of talk and this is where it becomes problematic. In this article, I will explain some of the reasons why gossip is such a bad habit and then list some useful tips to avoid it. Gossip and backbiting are unrestricted and derogatory conversations about other people which can involve spreading lies about someone, exposing their sins or passing hurtful judgements about them. There are many reasons why people resort to this bad practice: jealousy, wanting a sense of belonging or acceptance, out of boredom, to feel superior, to gain attention, or as a result of anger or unhappiness. Gossip hinders your productivity simply because it consumes time that could be used in other useful matters, whether it is in your personal or professional life. Backbiting, gossiping and negative speech are not only major sins of the tongue, but they can have psychological effects on your wellness and state of mind, as well as impacting relationships socially and in the workplace. This time should be used in nurturing speech that will help build our characters and intelligence, or in quiet reflection and worship to Allah . The time spent in gossip can instead even be used to relax productively! In social and workplace settings, gossip and backbiting do nothing but generate hostility and distrust in the environment, and is a really strong reflection of yourself and your character, as you portray yourself as untrustworthy, malicious and insecure. Constant gossiping is a sign that you are unable to create strong interpersonal relationships; if you need to resort to it in order to keep a conversation going or to simply ‘fit in’, then the relationship you are trying to maintain has already got weak foundation. If you are unable to attract your listener and engage with them in a knowledgeable, fruitful and nurturing conversation, then unfortunately the person you’re trying to build a relationship with, is most likely not interested in reciprocating friendship or a working relationship, but is more interested in the news and the gossip you transmit. To avoid being ‘radio transmitters’, it is an obligation to maintain morals and good virtue in social and workplace interactions. On a personal level, gossiping causes internal stress, whether you are a listener or a speaker, because negativity is exhausting! Backbiters inevitably transmit their anger, stress and negative emotions to the listeners, and bad moods can catch easily. Slandering and backbiting rarely make people feel better about themselves, and research has shown that it can cause anxiety and lower self-esteem. There is always wisdom behind what Allah forbids, and we have just listed a few of them above. I will now give you practical steps to implement in order to ensure that idle talk is permanently eliminated from your speech in sha Allah. Know your personal weaknesses, whether worldly or religious, and try to work on improving them. Being aware of your own shortcomings will allow you to find the humility in yourself and prevent you to see yourself as better than others. As a result of this self-awareness, you will consciously refrain from gossiping about others to increase your confidence or seek attention, because you know you have a lot to improve within yourself first. Working on your religious weaknesses is the greatest thing you can ever do for yourself. When keeping yourself busy to become a better Muslim, you’ll find yourself automatically censoring your words and watching what you say, because you are aware that Allah is The All-Hearer and The All-Seer. If you are a book worm – dig for new books, new authors and new topics to read. If you are a sporty person – look for new workouts and meal preparations. If you like Islamic education – read new books, make a to-do list of ‘must-attend’ lectures, and search for workshops and online classes. As you increase your skills, hobbies, and spirituality, share these life experiences and help your friends lead better lives by exchanging useful information. Share stories of your personal experiences: if you’ve lost weight, you went on an exceptional trip with family, completed an application process or even a public speaking event. Having these experiences will give you so much to talk about, and will give you the ability to help others in different situations. We all have social and professional responsibilities that can wear us out. It is fine for mother to talk about how tired they are from dealing with their teenage kids. It is fine for new mothers to ask for advice about pregnancy and afterbirth tips. It is fine for our mothers to talk about the new recipes of chicken tikka, samosa or pasta they tried the other day which the guests loved. It is absolutely permissible to speak about our worldly affairs, as long as this is not the essence of the social gathering, as it can easily lead to time-wasting and idle talk. 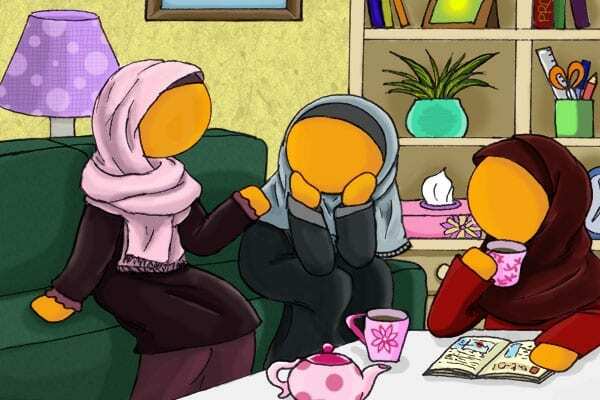 Though we may not be committing backbiting, lying or gossiping, our social gatherings should not lack the remembrance of Allah . Spend a few minutes of discussing new sunnah you revived, a dhikr you learnt or sharing a spiritual struggle you are going through is enough for you not to be from ‘al-ghafileen’ (those who forget to remember Allah and make dhikr). The mere fact that Allah is in your heart and mind at all times even when you do not verbally express it will make you among those who remember Allah , protecting you from the evils of idle talk. Surat Al Asr, though very short, composed only of three verses, is enough to make us shiver every time we decide to waste time on things that do not add anything to our worldly lives nor our spiritual and religious well-being. When reading the tafseer of this surah, one should think of nothing but how much the value of time is underestimated, that Allah glorified its importance and swore an oath by it in this surah. Time is not only a glorified created objected by the Creator, but it is also a burden. It will be very hard to argue saying we didn’t have enough time to make dhikr, dua, perform our salah or do hajj. The loss here is like no other, it is the loss of akhirah as well as loss in dunya. If you do not use your time in dunya efficiently and effectively, to earn halal living, seeking knowledge or making dhikr of Allah , then your loss is great, and has no compensation. However, Allah ends the surah by reminding us of what we can do to ensure we are not among the losers: we should be of those who have faith, do righteous deeds, encourage one another towards truth and patience. Be righteous, speak the truth, if you have no good speech to say, silence is your friend. “Whosoever gives me a guarantee to safeguard what is between his jaws and what is between his legs, I shall guarantee him Jannah.” [Al-Bukhari]. “He who believes in Allah and the Last Day, let him speak good or remain silent.” [Muslim]. Remember not to overwhelm your friends with your success stories or problems. If you do speak about your worldly affairs, make sure it does not lead to arrogance. Additionally, remember to try and not to overwhelm your friends and family either; they may have problems of their own and sometimes not talking is so therapeutic. Remember that any sin, intentional or unintentional, you accumulate by gossiping or backbiting will be only wiped out when the people you hurt have forgiven you. Strive to be from those who Allah described as “servants of the Most Merciful”, those who ignore ill speech with dignity. g. If you can’t change the subject, busy people away from it. Ask when will the food arrive, or how are they doing in university or work, or talk about the weather or any other subject (be creative!). I ask Allah to guide me and you to the right path. May He give us the courage and strength to stand and speak against what is not right. May He surround us with the good company that would always remind us of Him and encourage us to do righteous deeds. How do you avoid gossip and idle talk? Share your ideas in the comments below.